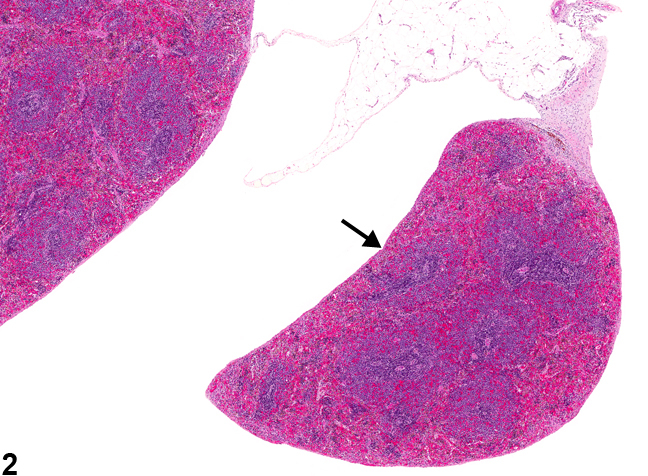 Spleen - Accessory in a male B6C3F1/N mouse from a chronic study. A nodule of splenic tissue (accessory spleen) (arrow) is connected to the spleen via a mesenteric attachment (arrowhead). 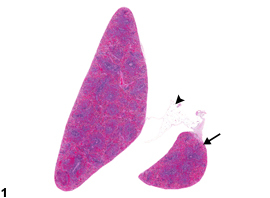 Spleen - Accessory in a male B6C3F1 mouse from a chronic study (higher magnification of Figure 1). The accessory spleen (arrow) contains red pulp and white pulp components. Accessory spleens ( Figure 1 , arrow) are rare findings in rodents and may be congenital, acquired following splenectomy, or a consequence of traumatic injury. When observed grossly in the peritoneal cavity, an accessory spleen may appear as one or more dark red to black nodules that have a smooth surface and range from less than a millimeter to several millimeters in diameter. These small nodules of splenic tissue have been observed in the mesenteric attachment of the spleen ( Figure 1 , arrowhead), pancreas, and elsewhere in the abdominal cavity. Histologically, accessory spleens may have all or some splenic components, such as the capsule, trabeculae, red pulp, and/or white pulp ( Figure 2 ). Accessory spleen should be diagnosed but not graded.